So it has been awhile since I have posted anything here and Nevada Smith the Head Coach at Keystone College has been begging me to post something. So here are 28 Competitive Shooting and Footwork Drills from Jay Wright the Head Coach at Villanova University. Enjoy! Here is a new list of characteristics of being game ready that I received from the Coaching Insider. If you watch basketball regularly or have just been enjoying the NBA Finals, you have heard a few stories of players stepping up or coming off the bench and being ready for their moment! Danny Green, Mike Miller, Gary Neal, etc…You never know when your coach may call your number so make sure you are prepared and ready! Relaxed: The days of getting psyched up are over. Research has shown over and over that the best performances occur when you are just slightly above your normal state of arousal, not the extreme. Confident: There is no fear. You should expect to be successful, not hope or wish to be successful. Completely focused: You are oblivious to everything else going on around you—consumed by the moment. Like a child playing with his toys, you are so absorbed in the moment that nothing outside can affect you. Effortless: Things just sort of happen with little or no effort. Automatic: There is no interference from your thoughts or emotions. Things are just happening. Fun: When you having fun its easy! 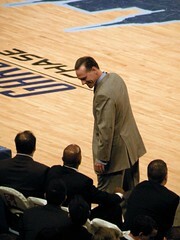 Jamie Dixon the Head Men’s Basketball Coach at the University of Pittsburgh has been known for his team’s great defensive play over the years. Below are some notes of defensive drills that he utilizes with his team. Enjoy! Below is a link to a couple of quick workouts; one for post players and one for guards. The workouts come from Coach Marc Skeleton a coach from Fannie Lou Hamer High School in the Bronx, NY. Enjoy! Below is a video of the San Antonio Spurs playbook that was put together by Iona College Assistant Coach Zak Boisvert who I have had the pleasure of getting to know over the past few years. This is a great video compilation and underneath the video on his YouTube Channel Zak has the plays diagramed for you to look at. Enjoy! I just found this article on the Men’s Basketball Hoop Scoop website and I just had to share this. Coach Peterman posted it earlier in the week and it really is a great article for parents who have kids playing sports at any age. It looks like the article was originally written by Layton Westmoreland. Great advice! 1. Be a positive source of support and encouragement. Save the critical evaluation of player performance for your coaches, they are the experts. Be an unconditional source of support. Criticism will break down parent-child bonds. 2. Be an attentive listener! We all love to explain our competitive experiences to others, so allow your child to talk about the game. Listen to understand first, and then reply. 4. Avoid undermining the coaching staff in post-game conversations, even if you think your coaches are out to lunch. You may not always agree with the coaches, but they are the leaders of the team. Second-guessing the coaches in front of your child can confuse him or her as to what he or she should do and ultimately may hurt performance. Also, you are undermining team chemistry and negatively affecting each person involved with that team. 5. Following tough losses or poor performances (or riding the pine) remind your child that their worth as a person is not related to their abilities as an athlete. Helping them recognize that tomorrow is a new day and that with hard work they can overcome what is keeping them from their goals will help your child deal with the frustrations of sport. 6. Be honest and sincere. Some parents get into trouble by saying “good game” or “you did your best.” If Billy does not think this is true you are going to get a sneer or sarcastic remark back. Be supportive in your comments but do not lie or exaggerate. Children will see through your well-intentioned attempt to support. If you attempt to hide your disapproval for your child’s performance your body language will signal the truth. Remembering that the goal of sport is to have fun and improve should help you in providing positive support and maintaining positive body language. 7. Stick to your normal routine no matter the outcome of the game. If you go to lunch after a win, do the same after a loss. 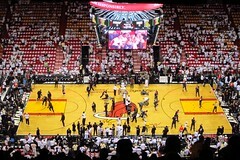 Otherwise, your child might relate the activities after the game with winning and losing. 8. 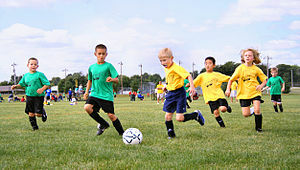 Avoid comparing your child to other children even as it relates to training methods or skills. It can create hurt feelings and pressure. Unfortunately, many parents unintentionally make the sport experience less than fulfilling for their children. These parents may have an inappropriate perspective of what sport is all about, but often it is the well-meaning parent that says the wrong thing at the wrong time (and does not learn from it) that gets into trouble. It does not take much for a child to feel pressure to appease his or her parents. And, you can create pressure just by being at a competition, let alone acting negatively.